Last night's performance by Boise's own 'Lightning Clouds' was another compelling performance for the lucky crowd on the Waterfront at Lake Harbor off State Street. The evening started off on the warm side but quickly cooled off as the sun set just west of Silver Lake. The Music on the Waterfront (MOTW) Free Summer Concert Series crowd contained many regulars and a number of new faces as well. Talking with folks I hadn't met on previous Thursdays' revealed that they were in town visiting family and friends and were brought to the weekly event by folks who had made the lakeside concert a Thursday evening tradition. The band was 'The Lightning Clouds' and according to their MySpace page, "...The Lightning Clouds is an electrifying 3-piece surf rock/reggae band from Boise, Idaho. 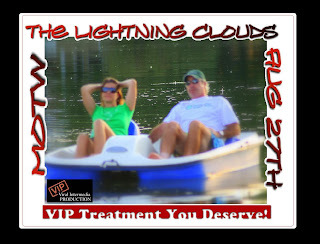 Specializing in a rich assortment of original songs and accompanied by a plethora of songs from other epic artists, the Lightning Clouds sets are always tight, fresh, and unique." There were a plethora (finally got to use that word!) of events going on throughout the Treasure Valley Thursday and so the normal crowd at MOTW was significantly smaller than usual. However, maybe because of the intimate atmosphere, there were more people dancing. Once again, the vibe was relaxed, friendly and ...unique. Carrianne Recla of the Boise Business Co-Op which is the sponsor and organizer of the new MOTW event said that she was pleased with the growth and turnout of weekly event and was already looking forward to next year's Summer Concert Series. As always Viral Intermedia Production or VIP was hand to film the event for our weekly MOTW web clip and to snap a few photos. Please check back in a day or two for the clip once we are done editing. VIDEO COMING SOON TO A WEBSITE NEAR YOU!